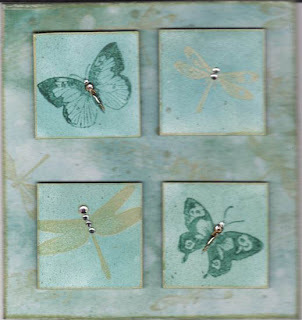 I inked 4 pieces of 2" square stampboard with Faded Jeans and Pine Needles Distress Inks, and spritzed them with a Forest Green Glimmer Mist. Then I stamped and embossed the butterflies and angels, and added some bindis and adhesive gems to embellish. For the background I took a piece of mountboard and used the same colours of inks and glimmer mist and randomly stamped over it. I started by water colouring my stamping bella stamp (topiarybella). I then drew some freehand butterflies and coloured them in with water colours. 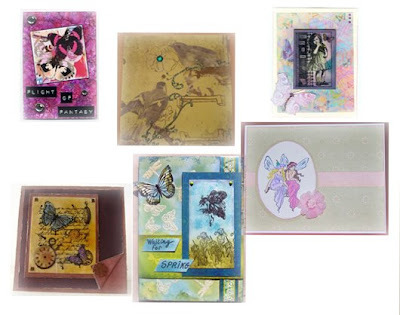 The pink paper I used was Cherry Arte Kitty Lou -Becca Boo. 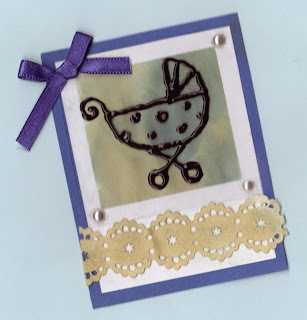 I then drew a freehand oval frame and put my stamp bella in the middle. I also drew a freehand tag and printed the words 'Your Fab'. 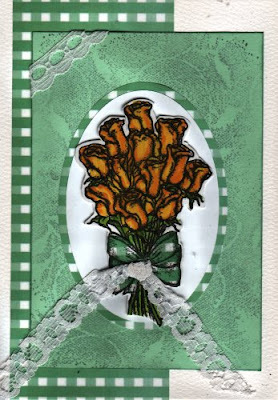 I then embellished the card with some lovely green spotted ribbon. I finished off with lots of pink glitter! I think this will definitely have to be my mum's mother's day card this coming Sunday! 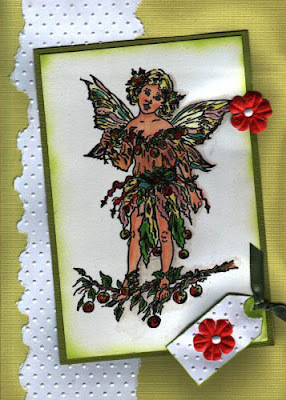 I decided to use one of my Faerie Poppet stamps for this week's challenge and she is stamped in Onyx Black Versafine ink and clear embossed. The image was coloured using Copic Marker Pens. I have smudged up the edges with ink and matted her onto a contrasting layer. 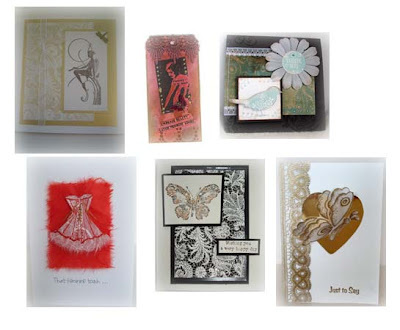 Mounted with 3D foam pads over a card base that also has a torn strip of white card, embossed with one of the new Cuttlebug embossing folders. 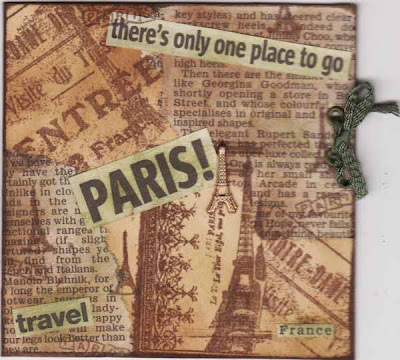 A tag, embossed with the same folder and a couple of flowers, have been added for embellishment. Hello & welcome to our 2nd challenge! 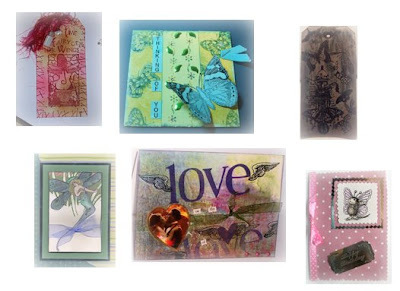 A Big thank you to everyone who took part last week, your work was beautiful! This week's challenge is.... 'Lace it up'. 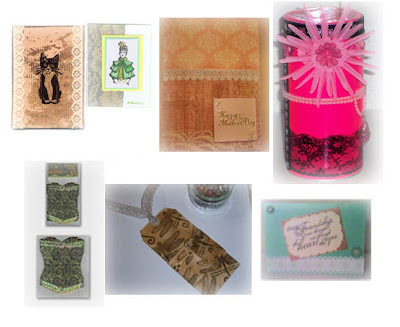 Use some lace on your work, paper lace, real laces or perhaps stamped lace. 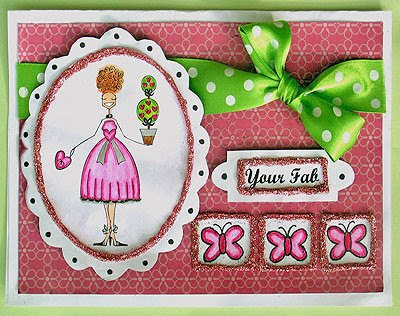 Remember you can make a card, tag, scrapbook page, ATC, or fatpage (4x4). 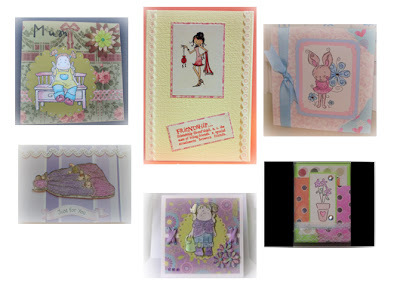 If you dont have a blog email your creations to, mytimetocraftchallenge@hotmail.co.uk The design team has been busy again and have made a few ideas for you. We really enjoyed working with lace it's so pretty! Have fun with the challenge. 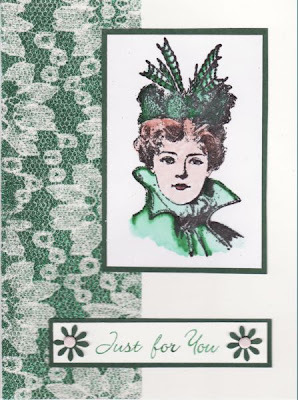 I have used a green gingham backing paper, the middle piece of card has been stamped with a Fine Lace stamp using an ink pad as close to the colour of the card as possible for a tone on tone look. The Bouquet of Roses has been coloured with Copic Marker pens and mounted 3D over an oval centre. I have embellished the corner of the card and the bouquet ribbon with an oddment of lace. I used a piece of double-sided sticky paper,cut to size and stuck on the left hand side of my card. I then laid a piece of lace onto it and poured green glitter on, shaking off the excess. I then took the lace off, and applied white glitter to the sticky bits where the green wasn't! I then stamped and water coloured an image of a lady, and matted and layered it on to the card. Finally I stamped a message and punched out 2 flowers and secured them with brads either side of it. 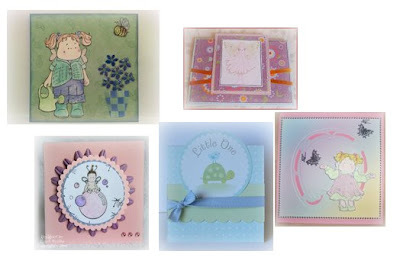 I have gone for a baby boy theme for my ATC. I started by mounting white paper onto blue card stock, then created a background using distress ink pads, colors: faded jeans and antique linen. I then drew a freehand babies pram onto acetate with black Aqua Glass outliner. I attached the acetate over my distressed background and then added a strip of K & Co Paper Lace ribbon (distressed with antique linen and vintage photo ink pads). I finished off by embellishing with violet ribbon & crystal sticker pearls. 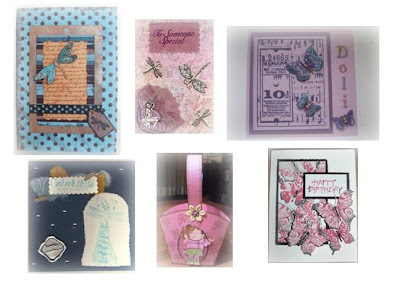 Hello and Welcome to 'My Time To Craft Challenge' Every Monday a new papercrafting challenge will be set for you to try (and to have some fun with!). Follow our theme and see what you can make. 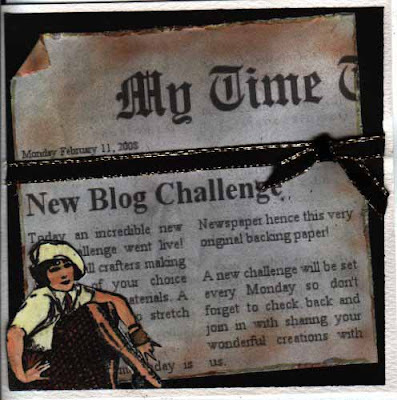 This week's challenge is.....Newspaper! 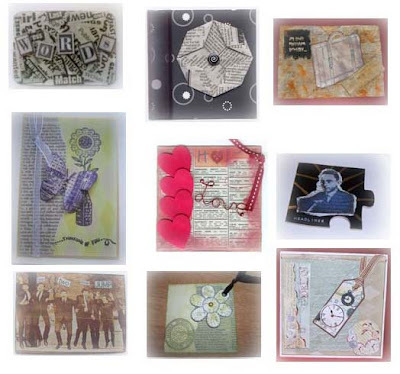 Use some newspaper on your work, cut out pieces from newspapers, use newspaper rubber stamps, or you could even design and print your own newspaper! 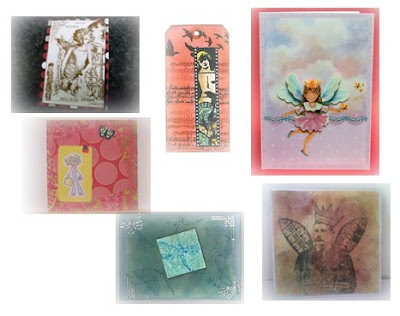 Make a card, tag, scrapbook page, ATC, Fat Page (4x4) ... and leave a link in the comments section so we can see your work. We have been busy making some ideas for you, hope you like them! Good luck, come by next week. I tore newspaper and inked it with Vintage Photo Distress Ink and stuck it on the two opposite corners of the page. I inked over the remainder of the page with the same ink, then randomly stamped with Versafine Sepia some images. I cut out some appropriate words from the newspaper and inked them with Peeled Paint Distress Ink and stuck them on. I added an Eiffel Tower charm and some eyelets and ribbon at the side to finish it off. I started by covering my tag in black cardstock. I then stamped 3 cats by Pink Cat Studio, 1 in black on newspaper and two in silver on black card (and mounted them both on mirri card). 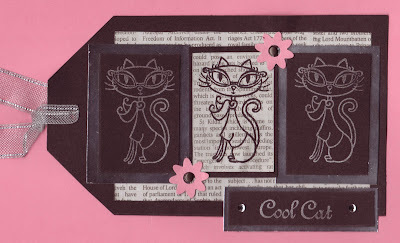 I then stamped my Pink Cat Studio 'Cool Cat' stamp on black card in Petal Point silver. I once again mounted it on mirri card. I then embellished the Tag with some silver ribbon, some adhesive gems, cut some flowers with my Bigshot machine and secured them on with brads. The backing paper has been created using one of the numerous 'create your own newspaper article sites' available. I have distressed the edges with a paper distresser and dirtied the piece up with inks. Matted and layered onto a black piece of card and embellished with metallic edged black ribbon. The corner stamp is from Tanda Stamps and she has been coloured with Copic Pens.